A “PURR-fect” First Friday Giveaway! Isn’t it amazing how fast time flies during the summer? It’s July already! The great news is it’s already time for another giveaway! 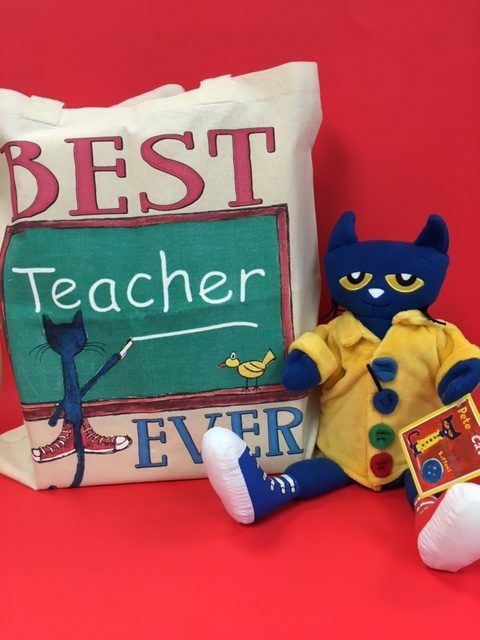 This month’s prize includes a Pete the Cat teacher tote and a Pete the Cat cloth puppet—both of which are adorable. And of course we can’t give away an empty tote, so we promise to stuff the tote with a fun assortment of books and school supplies. All that adds up to a “purr-fect” giveaway, don’t you agree? To enter for a chance to win, simply leave your answer to the following question right here on the blog no later than Sunday, July 15, 2018. Because Pete the Cat likes to rock some mighty fab shoes, let’s talk shoes! What’s your go-to teacher shoe? The Busy Bees! Although, I love to show up in my heels and they are my favorite, I switch into my clogs so that I don’t step on my little kiddos. My preschoolers tend to put their little hands where they really shouldn’t so better safe than sorry. I don’t mind changing into my shoes either because it kind of makes me feel like the Latina female version of Mr. Rogers. Most of the time, it’s comfortable ballet flats. I teach/direct at a preschool – you have to be able to stand comfortably for a few hours at a time & be ready to chase any runners! ???? Anything by Volatile! My absolute favorite. ???? Colourful, comfortable shoes like converse, adidas or bright running shoes are my go to. . As a kindergarten educator we do a lot of running from place to place. Comfortable shoes are a must. Fun shoes are a bonus! My favorite go to teacher shoes are anything that is flat, stretching, and comfortable. As a First grade teacher I need to move constantly in my classroom and throughout the building. If I wear any heels at all it doesn’t take long until I need to change into my comfortable flats. I have a pair of Skechers- Go Walk and a pair of Ryka shoes that I always rely on. My Gonto teacher shoes are scketcher BOBS! Comfortable yet dressy enough for the classroom. They don’t scuff while I am on my hands and knees in the busy preschool classroom! My favorite teacher shoes are Skechers slip ons with the memory foam. Sketchers always sketchers. I am on my feet moving and grooving just like Pete the Cat to wear anything else. Love Pete. My go to teacher shoe is a pair of Waldlaufers that are adjustable front, back and sides, so as my tired teacher feet begin to swell, my shoes are always comfortable! My favorite go-to shoes are Sketcher GoWalkPro. Comfort all the way! All winter long it’s Halflinger wool clogs to keep my toes warm and spring and summer are Keen’s. Oh and throw in a pair or four of Danskos with anything purple. I love Natural Soul shoes. They are very comfortable and don’t hurt my feet! Extra comfy but fashionable shoe, I only buy good shoes that I can be on my feet all day, low or flat is a must for me. I have 3 pairs of Birkenstocks and 5 pairs of Danskos that I rotate! I used to wear heels, but those days are gone! I admit that I LOVE my wedges – especially TOMS wedges – so comfy! But, I also have a pair of flats that I keep handy for days that require lots of extra movement. Comfort is the first must for my teacher shoes! I usually wear slip ons with a very slight hill. Boots when it’s cold, sandals when it’s warm and flats when it’s in between. Since the day can start cold and then warm up, I usually have a pair of shoes at school to change into. Sketchers – classic fit with cooled memory foam. Slippers! In the colder months we encourage our kids to get comfy. Off come the shoes and crazy super soft slippers come on! Love shopping for crazy slippers! Last years was little boo peeps sheeps….. on the hunt for this years school season! Outside are some sketchers sneakers, inside is usually socks or barefoot if the temperature allows! Flats lately but used to torture my feet with all the cute heels. Anything that’s comfy! In warm weather, sandals. In cold, usually sneakers. I teach preschool! Gotta be able to move! I’ve tried so many but I always come back to Skechers Go Walk. They are the only ones that keep my feet comfy! Usually it’s flats but more often then not I wear heels chasing 4 year olds! Comfort is what it’s all about. For me it’s Airwalk flats. My go to teacher shoes are anything comfortable, of course! So typically, I wear Bobs by Sketchers. Anything that slips on without socks! Usually black flats. I love my white,pink and black shoes….they are allllll good. I wear Clark’s or Skechers go walks for comfort while teaching pre k.
I wear flats and prefer cushion inserts. No more heels for me! Ready to move in an instant with my toddlers. I wear Skechers or Clarks sandals because i have major problems with my feet. I love my throw back Adidas. They are comfy and have a bit of style. I wear ballet flats, or any flat comfortable shoe that slips on! My favorite shoes are Go Walk Skechers-I have 4 pairs year round. I like to keep black, grey, navy, and sand. Like them because to me it’s the closet thing to being barefoot which is the best comfort for my feet. Since I have a fairly recent diagnosis of diabetes, my feet are an even bigger issue than ever! I’ve had good luck with Skechers or New Balance, but at the end of the day, whatever they are, they’re OFF! My “go-to” teacher shoe is my Vans, I like to match them to colors I am wearing and they are so comfy for all I have to do during my busy day with my preschool class. My go to shoes are my NewBalance shoes with my custom orthotics in them. Every single day!! My go-to everyday school shoes are Danskos. I have several fun prints that are totally preschool appropriate. What I mean about “preschool appropriate” is that Dansko have so many fun colors, material, and designs. My favorite pair colorful look like pen marker designs. The other great thing about them is if you get paint, glue, or other spills, you can just wipe them off! Anything Clark’s brand!! I wear their sandals when it is warm, and their loafers, slides, boots, etc all the other times. My go to teacher shoe is anything from flat boots, to sneakers to flip flops. I work in a preschool, so anything goes as we are on the floor alot. It depends on my mood and what is on the agenda for that day! Clarks, flips, or boots. But even my flips are Clarks! My go to shoes are anything comfy. During the colder months, a pair of good tennis shoes or boots. In the warmer months, sandals. As much as I’m on my feet, cushiony is a must, so I always look for good quality, no matter what I wear. I love sperrys boat shoes in every color! My favorite teacher shoes are Toms. I love wearing the red ones for Christmas parties and Valentine’s Day! My sneakers when I can get away with them. Always have a pair of Sketchers on my feet, usually sneakers. It was The Know Place, but they went out of business. Now I find lots of fun things at Target. My new balance sneakers or converse. My favorites are my Sperrys and my tieks. Comfy and cute is the way to.go! I love the Clark’s cloud walkers and sketchers walking shoe. Flats during the week and Converse on Fridays! My sneakers or my sperrys, gotta stay comfortable in prek! Thankfully, I’m allowed to wear sneakers go school! Skechers, as well as any other shoes with a sole that is cushioned but not flimsy! As a K teacher, I am up and down all day, and I need a shoe that is comfortable and easy to move around in without it falling off! I love my Toms and Yellow Box flip flops! Rocking in my new white school shoes! Working at a preschool they get covered in all sorts of things. Just like Pete’s! But do I cry? Goodness No! Would be honored to win, my preschools are in love with Pete right now! Usually a pair a simple flats or sandals. Sketchers for casual look, B.O.C. for nicer and a cute pair of flip flops when its warmer. My go-to teacher shoes are Tieks! I live in ballet flats and I would wear through my pairs in less than a year. Tieks last such a long time and are extremely comfortable and professional. Dansko or Clarks or any comfortable shoe with arch support. However, this past year I had plantar fasciitis so bad that my PT had me wear tennis shoes every day, so my go to tennis shoes are Asics. Ballet flats and sometimes boots depending on the weather. I stopped wearing heels awhile ago with all the walking around the classroom to help the kids! My go to shoes are Skechers Goga Mat slip one. The most comfortable shoes! We get to wear tennis shoes, I like sketchers with memory foam ???? I just bought some! Glad to see someone recommend them. ???? My teacher shoes are Tom’s or Naturalizers. Ballet flats. I have them in all colors. My students love to see what shoes I have on for the day! Thanks for a chance to win! Fit Flops! 9 months out of the year! I love my Jambu shoes! Many styles and are comfortable all day even if you where the same shoe all year! Skechers boat slip on shoes with memory foam. Wish I could wear my Reef flip-flops with arch support but they’re not considered professional enough! I usually wear Aetrex sandals when it is warm & Toms day r Clogs when it’s cold. Converse or New Balance are my go tos. Always moving in Pre-K and need to be quick on my feet! I always wear tennis shoes. I usually rotate three or four pair, depending on what I am wearing. That way, I can play with my students at recess, and still be on my feet all day. My go to work shoes are Merrell Mix Master Move Glide Trail-Running Shoes. I have them in 10 different color combinations so far ????. They go with everything and help me stay one step ahead of my kiddos! Merrill tennis shoes are my go to but if my feet could stand it every day, I would wear Minnetonka moccasins. Ryka’s the best for women’s feet. Flip flops in the beginning and end of the school year but in the middle, it’s comfy Sketchers! My favorite shoes to wear teaching are Birkenstocks! I teach kindergarten; therefore, I am on my feet moving and grooving all day! Definitely flats. My favorite are a pair of lace up black shoes with fuzzy pompoms. I have a bone spur on my right heel and shock wave therapy hasn’t done much so I’ve got doctor orders to wear crocks. They are ugly as all get out but so COMFY!!!!! Anything flat. I love my sketchers with memory foam as well. I have an assortment of colors to go with anything. I love my Vionics and Clarks! Great support. My go to teacher shoe is my black slip on Sketchers. I’m a first grade teacher and I’m always on the go. I need to wear a comfortable shoe. My go to teacher shoes are my ADIDAS! Alegria shoes come in great colors , texture and pattern. They are very comfortable and accommodate wide feet. I especially love the ones that resemble splattered paint. I teach art and my students love Pete the Cat! I have been known to wear flip flops in the warm months! I like my earthbound sandals with beads and charms. I work with 9ne ajr two year olds and they love to touch and play with the beads. My go-to shoes are sneakers. They give me support all day and I need that for prek! Plus I have to teach my own gym class twice a week, so that comes in handy to wear sneakers. Besides, we tell our students sneakers are best to wear to school, no flip flops or crocs, so if I tell my kids no flip flops or crocs, then I won’t wear flip flops or crocs. It’s only fair. I really like Clarks and Skechers. But a good pair of sneakers like New Balance are great also. Happy shoe shopping! I love my Sperry’s!!! They are so comfortable and I love the patterns and colors. I’ve even gotten my Teaching Assistant hooked on them too! A comfortable pair of sneakers!! I like the I Love Comfort brand. I find cute shoes that are comfortable. Merrells or Keens are some of my favorites. Definitely have to have Vionics every day! Couldn’t make it without them. I have several pairs of Sketchers that I rotate thru. Definitely have to have memory foam. Anything comfy! Right now I have grey plain tennis shoes. My favorite teacher shoes are my black New Balance sneakers! Toms, ballet flats and sandals! I love Croc sandals in the warm weather and since warm weather is my favorite, I guess they are my favorite shoes! My go to teacher shoes are the comfort plus ballet flats at Payless! they are super affordable and I have them in about 10 different colors! They are the only flats I can wear comfortably due to hip issues and they curve to support my feet perfectly! I love my New Balance tennis shoes. They have great support for all those hours on your feet and can double as “running shoes” if you are challenged to race with a 3 year old! Cute crocs. Our walk way tends to flood. If kids stuff on them I can rinse them off! I always use New Balance Gym shoes. I’m a preschool teacher and we are always on the go. I love Merrell shoes. Have to put supports in other shoes. My hand painted tennis, with school materials on them, that I drew for myself the first year I taught headstart and needed a pair of shoes that were comfortable, versatile and washable. I’m always looking for a good go to shoe….I have found some very comfortable croc sandals….they have the croc bottom with elastic straps on the to of the foot…cute and very comfortable. I also love any shoe with memory foam….but I will be checking out some of the brands I see teachers commenting about on here. Thanks for sharing everyone! Oh….and I ??? ?Pete the Cat books….I have a real live Pete the Cat at my house….he’s my sweety Pete and I actually read him Pete the Cat books….I know weird but my students love when I share photos of me reading to him! Sneakers! I have some foot problems and haven’t found narrow shoes that also address the issues. My TOMS wedges! They give me a little height (I’m only 5 feet tall) but are super comfy and supportive. I love cute ballet flats. I also like generic tom knockoffs. Anything comfy because I’m on my feet all day. I am required to wear tennis shoes where I teach. I prefer Sketchers but might be looking at other options this year. My go to shoes are either my converse or toms! Definitely my Sketchers boat shoes, or a simple, comfy black flat. Comfort first…we put a lot of miles on our shoes! Whatever is on sale, but when I can wear my Nike! We don’t wear shoes in the classroom (socks only), but do go outside and need to slip shoes on quickly, so I wear Propet TravelActiv Slip-On. I wear WW shoes, so Propet shoes and sandals are my favorites. Very comfortable and long-lasting. Thanks for the giveaway opportunity! My go to shoe is a pair of flat sandals or flat slip on shoes. I go for comfort and increased ability to keep up with my students with special needs. Comfy flats with good tread. Can’t go sliding down the hallways if you get a runner. Tennis shoes on casual days. My favorite school shoe is Sketchers Go Walk with memory foam. My go to teacher shoes are whichever ones are comfortable for a long work day. Anything comfortable to walk and run in all day! Typically converse or some comfy ballet flats. Sandals when it’s really warm outside. I like comfy flats, wedges, and dressy volatiles. My go to shoes are Skechers and cushioned sandals since I am a pre-k 3 teacher. My go-to teacher shoes are my comfy tennis shoes. I teach preschool so I have to always be on the move and comfort is my top priority. New Balance shoes are my comfort shoes. My preschool class keeps me busy. Dansko or Brooks depending on if I have recess duty or not. Much easier to navigate the playground with tennis shoes! Teachers need good support to walk on the concrete floors all day. I love my Clarks flats and yellow box flip flops! For me to be comfortable and be able to do many tasks I just wear my sneakers! Red Keds are my to-go teacher shoes! My favorite go to shoes are a pair of booties with a small heel. My go-to shoes are a pair of sporty Mary-Jane’s from LL Bean! Comfy, supportive but not quite tennis shoes. As a “veteran” first grade teacher on the go, I need all the comfort I can get! I have foot issues so my sneakers are my go to shoes. Thankfully, my principal is a cool cat! Vans or converse… comfy but cute ???? I own a bunch of Van’s. My sparkly black or my Mickey Mouse are mine and my kiddos favorite! Comfy and perfect for first grade! I love my Skecher flats with memory foam. I like Clark’s or Sketchers. My favorite school shoe are my Crocs! I have several pair in different colors. I teach Kindergarten and I am on my feet all day. When I wear my Crocs my feet are not hurting when I go home! Dansko clogs are my go to most of the year…I give them a break in the warmer months and wear my BOB’S espadrilles!!! I love my Under Armour tennis shoes! Anything flat – memory foam makes it even better. My go to teacher shoes are my Frye boots! They’re stylish and super comfy! They match with everything! My favorite go-to shoes are definitely my Sorels. I have different pairs that I wear and they are so comfortable! I love my blue shoes!! Blue running shoes made by Nike. The kids love the color! Just comfortable tennis shoes. Or flip flops in the summer. I wear comfortable shoes, mostly flats with inserts. I love wearing skechers on days I can pass them off. Teachers are on their feet constantly especially in lower grades. I teach Pre- k and dont even sit at my desk except to mark.attendance on my.laptaop each morning. My class loves Pete the Cat and I love Mailbox. I still have every issue and use them constantly. I have a pair of tennis shoes that feel create on those days I know are going to be 100mph day. I love wearing Crocs! They are so comfortable and I can kick them off easily if I need to! I teachpreschool children with disabilities and need to be able to take off running from time to dinner! My students really love Pete the Cat and Pete has been our classroom theme for the last two years. Flips flops in the summer and Sperry’s in the winter! TOMS are my favorite teacher shoes! My go tos are typically Keens. I love that they’re comfy and casual looking…wear with dress pants, khakis or jeans ! My favorite shoes are Nike, I need a comfortable pair of shoes to be on my feet all day. Business casual Crocs! They look professional, come in many cute colors & styles, and allow me to walk, play, teach, etc in my classroom all day, everyday! I teach Kindergarten and have been wearing crocs for years! They make so many different styles and are so comfortable! Yellow Box Flip Flops(warm months) and Bobs slip ons(cold months) are my favorite! Sketchers “Step-Ups” for Standing or Running if needed!!! My go to teacher shoes are anything comfortable, glittery and fun,like ballerina flats, adidas, converse and my running shoes. I’m a preschool teacher and spend the day moving around and running. Fun and bright shoes are always a plus! I love to my black Clark slip on shoes! They are very comfortable even when standing all day. I love my Bobs with puppies on them. They have super comfy memory foam. Lucky to be able to wear cute tennis shoes most days! My favorite go to shoe is sketchers with memory foam. Feels like I’m walking on pillows. Crocs tennis shoes or sketchers. A pair of Bobs shoes, so comfy and they make a donation to dogs!! Bob or Tom Slip ons. Classic canvas Toms are the most comfortable shoes in the world! My go to shoes are Naots. I also like Fit Flops. In the summer, crocs sandals. Yes crocs! The are comfortable and come in many styles. The rest of the year anything by sketchers. My new shoes are Nike Air 270, they really help my heels and they make all day standing on hard floors easier!!! I have spent most of June turning my K4 room into a Pete the Cat room. When I decided it was time for a redo I knew I needed to pick something I loved so it was Pete The Cat!!! Everything is lovely and I am going to be starting out a new year in a bright and cheery new room—dedicated to the one I love—Pete!!! ???????? Love my tennis shoes from Rocket Dog they are comfy and look good with most of my outfits ! Sketchers! Anything else and my feet hurt! My go-to teaching shoe are my “chucks” of course! I have them in various colors to match the different outfits I have! I love “rockin” in my converse sneakers! Ascis tennis shoes, clarks sandals, yellow box flip flops and am still on the search for the best flat. I do know that Tieks are not the most comforable flat to me. In the fall/winter its Dansko! I have built an awesome collection of crazy prints. Spring/summer is Converse , running shoes and Birkenstock.These old feet need a lot of love! ???? Crocs sandals, I have them in flats and wedges, and ankle booties in the winter. I’m rockin in my teacher shoes. I’m rockin in my teacher shoes. What know what I’ll step in through my day in pre-k, so my go to shoes are my most comfortable pair of nike’s! A black loafer that I buy at Payless. They are so comfortable! They are cheap, so the don’t last as long as I would like, but they are the most comfortable shoe I have ever found that looks good with dress pants! Ballet flats or my gray vans. Loafers. I tie enough shoes in preschool without doing my own!!! Super comfy ballet flats or Danskos in winter! I love my tan Skechers with memory foam. It’s like walking on a cloud. If I was going to step into anything it would be with my new balance running shoes ! I love my new balance shoes ! My toms or a nice pair of tennis shoes! Birkenstock sandals in warmer weather and boots during cold months. My favorite go-to teacher shoes are the ballet wedges from Faded Glory at Walmart. They are amazingly comfortable and affordable at around $15. The memory foam insoles are perfect for long periods of standing or walking and since they slip on, they’re convenient and a real time-saver. I love to wear either flats or my Toms. They are so comfy and my feet don’t hurt at the end of the day! Have to say as often as I can mask my Birkenstocks lately- those are the best days for my feet! Anything flat in fall and spring and boots in the winter. I am comfy in Clark’s flats. I love my Toms or my Bobs. Sometimes, if I feel like tying my shoes, I’ll go with some Nike’s. I am always happy in a well cushioned pair of sneakers. Aersoles are the shoe for me. So comfortable, stylish and affordable! And of course, sneakers for extra casual wear! Sneakers because we are in the basement in my school and it is cement floors. Kindergarten loves Pete the Cat! I see a lot of Skechers on here, but I really like BCG athletic shoes. I also wear Mad Love slip -ons from Target. My most comfy shoes are by Clarks from sandals to low boots! I wear Bobs or Toms almost every day. The memory foam makes them very comfortable for all day standing. My go-to shoes are Toms! I most often find myself wearing some black clog-like shoes by b.o.c. So comfy! Or some Skechers sneakers or flats. But we wear slippers on our classroom and my fave ones are from LLBean. Anything that’s easy to slip on and off- I teach Preschool so I need the easy on and off when I sit on the floor with the children! My go-to teacher shoe is TOMS! So comfortable and look great with everything! I almost always wear black converse!!! They are comfy and can go with anything!! Sketchers in the winter and yellow box flip flops in the summer. My go to shoes are Toms. They can be casual and dressy at the same time, but are super comfy. I try and get cute ones which are a great conversation starter with the students. My go-to teacher shoe is a pair of comfy loafers. I wear stretchy ballet flats in the spring and boots in the winter! I love when the cooler weather comes and I can break out my boots! My go to shoe is Earth shoe. Comfortable and stylish!! My go to teacher shoes are Vionic Orthoheels! They offer great support and make many cute styles. I wear them all year long! My go to footwear is anything that is sparkly! I have silver sequin sneakers. I have gold Sperry sneakers and I have black sequin sneakers! My preschoolers, boys and girls love seeing what sparkly shoes I’m wearing for the day! My go to school shoes are Aerosoles flats or sandals depending on the season. Toms are my favorite. They are cute, and comfortable! They have so many styles. I also like that they give back to those in need. I love sketchers with memory foam! I have a variety of Clark shoes. My feet at not tired or sore by the end of the day. I have a couple pairs of Sketchers Slides that I love. A few days ago, I purchased a pair of Union Bays and they are sooo comfortable. I believe they will be my new “go to” teacher shoe! My tennis shoes. They are the best and provide the best support. I hate shoes. The more I can be barefoot the better. So we have no shoe days in my prek class???? Love Dansko shoes and all the fun designs-and they’re super comfy too! My go-to teacher shoe are my TOMS shoes. I have them in a bunch of different colors to go with every outfit. I wear them all year round. I love how comfortable they are as well as giving kids shoes that need them with every pair I buy! My go to shoes were always flats. Now after 30 years of being on my feet it has to be shoes that my custom orthotics fit into. Toms and are great for the warmer months and riding boots or loafers for cooler months. Flats for sure! I never go higher than a 2 inch heel EVER, lol! My go to teacher shoes are flats with a cousiony insole. Anything that gives some extra support is the best. My sparkly black sketchers. They are super cute and comfy!! I love all types of shoes as long as they are comfy. Memory foam flip flops…they are so comfortable! I wear any shoes. I teach at a Hutterite Colony and everyone, teachers & students alike wear the slippers that the mothers & grandmothers make. I get a number of pairs every Christmas and throughout the year. I teach K & 1 at a Hutterite Colony. I wear slippers given to me that are made by the mothers and grandmothers of my students. Cute & comfy???? The go to shoes for me are plain old canvas tennis shoes. They come in different colors so they can match my outfits. It depends in the weather. If it’s hot outside, I love my Keens sandles. If its cooler, I like my Toms flats. It’s all about comfort! Flats with a gel sole (and tenners on Fridays)! My shoes are not as colorful as Pete the Cat’s, but I were Propet stability walker shoes that have excellent arch and ankle support. Comfy tennis shoes. Sketchers are good. I love Pete the Cat!!! My classroom is decorated entirely with Pete items! ???? My go to teacher shoes are black flats. ???? Soft memory foam flats in the summer , and memory foam lined fabric boots in the winter months . Nike’s & Croc’s. Anything Comfortable! My go to shoes are my Asics. Fun, but comfy. I love wearing the Easy Spirit clogs. ???? My purple & white gym shoes. My favorite shoes are Teva sandals and Alegria’s. I have two pairs of shoes from Hot Chocolate Designs that I LOVE! One pair looks like world maps, the other like a composition notebook (one foot looks like the cover, the other like inside paper). They are both super cute and comfortable too!! Any slip-on tennis shoes with memory foam are my favorite. Tennis shoes – as a pre-k teacher, they come in handy for keeping up with the kiddos! Anything by A2 ( aerosoles). I am short , so I prefer a wedge so my pants don’t drag. Skechers tennis shoes have been the most comfortable. I love Tevas for warm weather and Lucky brand flats for cooler weather. Clark or Skechers are my go to shoes???? I usually wear a tennis shoe that matches the shirt I am wearing. My favorite teacher shoes are my Merrell Mary Jane style. I love the ones that are taupe color with chocolate brown leather. My friend teachers laugh…they call them my “fancy tennis shoes). I am changing grades from 2nd to K. I know my new Kinders would love Pete the Cat. It would be Purr-fect! Pierre Dumas or Clark’s are my favorite shoes for teaching!!!! Luckily, we have the freedom to wear most anything we want. My go-to is Sanük yoga slings. So comfy! I’ve been pregnant for two of the last three school years, so my chubby preggo feet needed something squishy and open! My go to teacher shoes are tennis shoes. My go to teacher shoes are slip on sneakers. I am always on the go and also on the run with interesting things to do with children and fun activities. They are also flexible and comfortable so that my feet do not hurt or ache. And that is also a plus. ???? My go to teaching shoes are my slip on Skechers! They are not sneakers, but just as comfy for being on the go all day in kindergarten. Chacos. I love their sandals and closed toe shoes. Great support and very comfortable all day long. Anything Skechers !! I love their shoes!! I love my Easy Spirit walking shoes. Great for old school feet! I love my new balance tennis shoes. Great with jeans, khakis, shorts, and comfy for all day wear. My favorite teacher shoes are my sneakers. My go to teacher shoes are Toms! They are comfortable and cute! My go to teacher shoe is any form of flats. Flat sandals, ballet flats, flat boots. I teach kindergarten so comfort is key. Vionic w/ Orthaheel Sandals , they are a little costly but they provide amazing support! Any Easy Spirit closed toe for cooler weather. The best for warm weather are my Fit Flops! Birkenstock in warm weather and in colder weather tennis shoes. If I was allowed it would be backless sneakers since that is a no-no it would be my sketchers! Love my Toms and Skechers Bobs! My favorite teacher shoe is one that protects my toes! I had a student one year who managed to step on my feet sometime during the day no matter what I did. Loved the child but my poor feet! My Keen heeled shoes have been very comfortable to wear almost year round. They’re waterproof and have great traction – two very good things to have for our New England winters! My Skeetcher tennis shoes in navy. Sketchers tennis shoes with memory foam! I like to grab my sneakers. I need comfortable shoes. I’m on the floor playing with the children. Either ballet flats or sandals. I live on a tropical island. I love wearing my Birkenstocks or Tom’s! Although, I’ve always wanted a pair of Tieks, I hear they’re amazing when you are on your feet all day. Being a SPED teacher and having to often lift students, supportive shoes are a must! My absolute go to shoe for school is now my Hoka’s my daughter gifted me for Mothers’ Day. My administrator is all about the shoes we find most comfortable. My go to shoes are Clark’s and Skecher’s! I haven’t found a perfect pair yet, but I do like my FitFlop flats! My Sketchers. Comfort is key! Anything comfortable since I am on my feet so much! I am super picky about my school shoes, but I’m always “rocking” in them! ???? I have comfy flats from Naturilizer. I am always on the floor. I like the slacks and jeans from White House Black Market and for teaching supplies I use Discount School Supply. Any kind of sneakers! I wish I could wear flip flops, but our principal frowns upon that! ???????????? My Brooks! If my feet hurt I can’t teach. Gotta be comfortable! My first classroom position, Kindergarten, I started the year with comfortable sandals then comfortable shoes. When the middle of the year came about, a surprise broken ankle, well, one cast and one shoe. End of year I celebrated with my favorite, back to sandles. Sperry tennis shoes or converse! I live in Arizona. My teacher shoe is ABEO Fantine sandals. They have support and fit my foot style, without being too warm. They are about $100 and will last most of the school year. I have the copper colored ones, so they are dressy enough to wear with skirts. Flats all the way! I must have comfortable shoes! Spring time will be my sandals, winter time will be my Uggs. My go to shoes are tennis shoes with support! Love when they have memory foam. My go-to for shoes are flats. Anything that is comfortable and light on my feet. Skechers, kids, Born flats, tennis shoes on Friday! Anything “go walk” or “memory foam” from Sketchers. Love their Bobs and “Gogamat” shoes and their “luxe foam” sandals. Can’t wait to get some new ones this summer!! My go-to shoes are my Asics. They are the gel type and are super comfortable. I start my day in something a little dressier but by the end of the day I find my Asics are what feel best. Asics running shoe. Always ready for a run after a kiddo and great support for all day on the feet. New balance running shoes in case I have to catch a little one. Go walkers are the best. They are so comfortable. I love my slip-on black flats. Right now it is a pair of converse with colorful paint splatters. My pre-k kids love them! Sketcher with memory foam since my preschoolers keep me moving. SKETCHERS! Sketchers hands down! That memory foam is the best! I bought one pair of Sketchers with memory foam and wouldn’t wear anything else after that. I have back problems and they are a big help! My best go to shoes are a good pair of Nikes. I teach preschoolers all day in which I am on my feet for the majority of the day. I have tried several different brands, but always come back to Nike. Oh by the way, I LOVE Pete the cat. We had a family fun night and every food item, games, pictures, and activities were all Pete the Cat related. Both the children and the parents loved it. Mine our my white shoes!! They are super comfy and they are slip ons!!! My go to school shoes must be comfy, I’m on my feet all during the day Monday -Friday. I like to dance, exercise, and play with my children in class or outside. Catch the runaways, or a child needs quick help. There is no down time for my feet. So I got to be on my best toezies everyday. I like my New Balance tennies! They are perfect for the 10,000+ steps I take every day at school. Do I cry with all those steps daily? Goodness, no! Tieks and my sketchers! My tieks are the perfect ballet flat for tanging all day in when it’s nice out! And sketchers are perfect for any less than perfect weather! I have to wear tennis shoes. I have one pair of Nikes and several pair of New Balance. In order to look more professional, I get them in different colors. I love my white shoes.! I love my brown shoes! I love my black shoes! I love my gray shoes! I’ve been wearing Skechers Reggae sandals since May-super comfortable for chasing 3 yeard olds all day! I wear sandals everyday, except when it’s cold. My toes have to be free for me to be comfortable. I’ve worn sandals to work for 16 years so I’m very comfortable in them. I enjoy any comfortable, colorful flat. I have too many to count in all different colors and patterns! Sandals and flip flops… not the most supportive but if I can’t be barefoot it’s the next best thing for me! In the fall/winter I generally wear boots (some warm, some tall and cute)… one day I’m sure I’ll need support but for now I can still wear whatever I enjoy! My go to teacher shoes are some black ones from Payless. They’re super comfortable because they have memory foam in them. I’m on my feet the majority of the day, so I need comfortable shoes. New Balance with a little extra toe room to avoid getting tootsies crushed every time the kiddos lack spatial awareness. I go to a colorful pair of Nike’s. Always on the run! My go to shoes are Sketchers with Memory Foam!!!! LOVE my Nike tennis shoes! My go to teacher shoes include a pair of broken in Converse All Stars, with paint splatters on them, for those messy art days and action packed outdoor play times. I also love my Roxy slip-on with memory foam inserts, especially for field trips. I am an Education Coordinator/toddler teacher with a center that serves families with children aged birth to 10. When my schedule requires me to visit several classrooms in a day, I wear my New Balance sneakers. I like my sandals until to cold to wear then my tennis shoes. Comfort is the key. My favorite teacher shoes are anything comfortable! I wear flip flops or boots or tennis shoes!! I teach kindergarten and comfort in key! My plain white tennis! I love my white shoes! Comfortable and easy to maneuver! I love my Toms and Converse! Both are super comfy and the kids LOVE the prints on them. My favorite go-to teacher shoe is my Sketchers ???? Comfortable shoes are a must. I wear Clarks shoes. They are comfortable and sometimes even fashionable. I do like any shoes that are suede ~ especially my Clarks! I always love when I can wear my tennis shoes! Flats with a cushioned support added. No shoes at all, but anything comfy when shoes are required! Rockin in my tennis shoes???? I love my Toms! Or if the weather is nice I like my Skechers flip flops made from yoga mat material. Sketchers with memory foam! ???? I love wearing dressy sandals and flats to work, but since I work in a casual dress preschool I LOVE wearing my Vans. They are so comfortable and I can wear them all day. I travel for my teaching job, so it always depends on the weather! Tall boots in the winter, pretty sandals in the heat, and all kinds of cute flats for the inn between weather! My go to shoes are running shoes. I teach special ed and some of my students are “runners” which leaves me with running after them. Couldn’t survive the day in other shoes. My go-to teacher shoes are Skechers Bobs! My favorite shoes are anything Dansko! Mules, katy flip flops, Sophia sandals, they are all very comfortable and help to keep me rocking in my cool shoes! Clogs! I love being able to slip off and slip on my shoes. My go to shoes are ASICS tennis shoes or sketchers. The Sketchers look better with my dress clothes, but the tennis shoes support my previously injured ankle better! My go to teacher shoes are my Tieks! They are so comfortable! Sandals….easy on off and no tying! My go-to teacher shoes are Skechers sneakers with memory foam. They are like walking on clouds. We stand all day everyday and these are the best I’ve found. My Keen Flip Flops or my Birkenstocks. Comfort, not cute is what I want! I have a pair of black and a pair of brown dress flats from Eddie Bauer that I wear all winter long! In warm weather, I wear lots of sandals. Anything with a good sole and tread so I don’t slip. I work with toddlers and they’re always spilling drinks as they learn to drink from a cup. Toms! Lots of color and styles to match my outfit. My go-to teacher shoe is a ballet flat. They’re flexible and still cute! At the moment I personally like to rock some Skechers flip flops since I teach all summer. Other than that it’s sneakers all the way!! My favorite go to is my tennis shoes with memory foam….I have a few fun pairs that I wear through out the week. Slippers wirh non slip grips on the bottom for rainy days so dirt and water isnt left on my classroom floor. Other days its tennis shoes with memory foam. My go-to shoe is a pair of black flats. They go with everything, are super comedy and don’t add to my 5’10” around littles! I don’t have any. I wear what I have. Going threw a lot and can’t afford shoes. My bf has his leg amputated and we have to move ???? My go to shoes are Vionic and Clark’s. Both are comfortable when you spend all day on your feet. There are many cute styles. My go to shoe is either Clark slip ons or Nike’s! My Kindergarteners and I love Pete the Cat! Black flats with memory foam if I dress up because I have an IEP; or, flat canvas tennis shoes if it is school spirit or college t-shirt day. My favorite teacher shoes are SKECHERS, they have good memory foam and are great on slips, and they come in so many Style and colors. I am always on the move with my Pre K students. I will Love my Pete the Cat tote bag, and we will love ❤️ having Pete the Cat in our Classroom. I wear Alegrias mostly. They have great support and form to your feet. I have them in sandals, flats and mary janes. For trainers I wear Hokas. if I wear anything else I have to wear powerstep insoles. Gotta love those cement floors! Sketchers. Because We need comfortable shoes for our busy days. Toms, Bobs or similar slip-ons.. usually pretty comfy all day! My go to school shoes are yellow box flip flops! My go to shoe is Yellow Box flip flops. I wear them even in the winter!! Well-made leather clogs with a wooden sole. My favorite shoes for work are Skechers or any kind.of tennis shoe with arch supporrt) memory foam. The many colors of converse!!!! They make me feel fun and ready to run!!! ???? My maryjane crocs or sketchers. I love Sketchers Memory Foam shoes!!! They are super comfy and stylish and give me the support I need to move around and interact with my students in the classroom. And they are pretty reasonably priced too!!! Comfy slip on sandals are the only way to go. Always be a comfortable and Happy CAT. Sketchers with the Go Go mat insoles are my must haves. My go to depends on the season. Summer is my mesh yoga shoes thin and airy. Spring and fall is my gray running sneakers. In Winter it’s very icy where I live so, I wear snow boots. If it happens to be snowing I put snow chains on my boots. I love wearing warm slippers. I got a couple comfy pairs from Costco this last winter and wore them almost everyday. I would change out of my boots and into slippers. Go to is flats for me! Anything comfortable! Usually sketchers or toms-like….because actual toms are not in this teacher’s budget, haha! Anything with a memory foam insole! I love wearing crocs. I have found some pretty cute ones I can wear casually or with dresses. Saucany! I live in those shoes from Aug-June! I love my Sketchers sandals and my Nike sneakers. OTBT…..it’s hot down south so I usually wear open toed shoes year round. Our only requirement is they must have a back strap. My “go to” shoes are comfy boot shoes with lots of cushion! Great Friday give-a-way! Chucks….or my “Chuck” wanna be’s from Target. I get them from Ross or Target when they are on sale. My go-to teacher shoes are flat sandals in the warm weather or flat boots in the fall or winter. My go too are Keene, but I am a shoe person and love flats of all kinds!!! Star Wars, ladybugs anything fun. provide my feet with the perfect support and leave me feet feeling great all day. Because I have feet trouble, I have been using Avia sneakers. Currently I am wearing one Avia sparkly pink shoe on my left feet, on the right side I have an aircast boot for at least another month. Once I can replace the boot, I will be wearing a post surgery shoe of some sort. Once I feel abel to drive safely, I can wear the Avia shoe on the right foot, taking the boot on and off as I need it for weight bearing protection. I love my black shoes, I love my gray shoes, I love my white shoes by Sketchers. They are my Go to everyday and are a lifesaver to my feet. Sketchers with memory foam are the most comfortable. I wear TOMS a lot, but I add my plantar fasciitis insoles and they are perfect! I have two go to teacher shoes, the first are my black and white converse they are great on my feet when I am running around doing activities with the kids. The other are my Nike running shoes and those are even better for me when we have big school wide events. Fit Flops! I wear them 9 months out of the year. Sanitas or ballets from crocs or merrells for me. I’ve discovered a brand called Vionic. They have a great arch support!! I currently only have their sandals, but may get some others soon! My go to shoes are New Balance. I have flat feet and need the support, especially after being on my feet all day. I love my Converse and Toms because they’re fun and colorful. They’re perfect for teaching my first graders! My go to shoes are anything cute, stylish, comfortable, and flat! When I first started teaching kindergarten 17 years ago, I wore stiletto heels every day!!!!! Eeeeek! What was I thinking??!! Now my shoes must be cute, colorful, sparkly, but definitely flat!!!! My teacher go to shoes are any type of Dansko. I’ve been wearing them for years and when you teacher first grade and kindergarten you need to be quick,comfy, and flexible!! I’d received them in a heartbeat to anyone!! I love Clarks, Earth, and Birkenstocks! Who doesn’t like Pete the Cat!? He is awesome! I want to use him during silent sustained reading for my students. Hopefully I can do so, with this outstanding gift. Lately it’s been dansko clogs. I Love some shoes that look good, but mostly comfort. I might even try some like Pete’s! My Chaco sandals, wear them till it gets to freezing temps!! I wear different types of shoes. It depends on what I am doing that day. Mostly flats. I think my favorite shoes to wear when I’m going to be spending the day teaching are boat shoes or canvas shoes. They’re simple, comfortable, and good for a variety of activities. Sketchers are my go to shoe!! Sketcher, I have to have comfort. My favorite shoes are Jambu sandals. They are closed toe, cushy with good support. Anything kind of dressy flats or sandals without a high heel, and on more casual days my Converse sneakers. Rockin’ in my comfortable sneakers…the only shoe for dancing in Pre-K! My favorite teacher shoe is Keens they are so comfy and coulourful sorry and dressy all at the same time!!! I love my Sketcher slip-ons! I love to wear comfortable tennis shoes . I bought some Skechers for a walking vacation this summer and kept thinking how they are going to be my new every day shoe at school! My go to teacher shoes are a pair of brown Danskos. I have had them for years and they are awesome. Sturdy, comfortable, and supportive. A colorful pair of Nikes or a skecher memory foam slip on in black get a lot of use in my preschool wardrobe. My go to shoes are running shoes they provide great support. I ❤️❤️LOVE❤️❤️ any shoe with cooling memory foam. My current fave is a pair of flats! I am a tennis shoe gal. I get to work a little bit early because I have to drop off my daughter right across the street at the high school. I take a walk, and then I’m good for the rest of the day. My feet and legs really do need the support. Dollar Tree and Target are my go to teacher stores. I can always get what I need. New Balance! I wear them everyday and everywhere. Definitely my Danskos! All 25 pairs of them- ha ha!!!!! Crocs has some cute wedges that are super comfortable. I am more of a flats kind of teacher, and seek out something with support. My go to teacher shoe is either my comfortable flip flops or my nikes! My kids love when I wear the same shoes as them. Birkenstocks all uear long to chase my early preschoolers! ❤ And they LOVE Pete the Cat!! I rock a pair if Ariat Heritage RT Paddock boots. Since spraining my ankle last year I need the ankle support, plus Ariats are woman owned and have great arch support too! Not to mention my arch support system fits the best in these boots. My lovely mother buys me a new pair every Christmas and I then wear the old pair to the barn to ride and care for my horse so I get to wear them twice as long. CROCKS !!! They have sandals too!! sooo comfortable!! Nike Air Max They aren’t pretty but they cushion so well! My go to Teacher Shoes are anything by Sam Edelman!! So comfortable and cute. Booties are my current favorite because they go with everything…black and tan!! I usually get any ballet flats that are on sale at Famous footware. I find most of their shoes to be super comfy! Sketchers with cushy insoles! Love them! My go to shoes are my ASICS. I live in those shoes during the year, during the warmer months I wear my keen sandals. After 2 ankle surgeries, I need good supportive shoes! Ecco sandals. I have 2 pair—brown and blue. Comfy! American eagle womens Rachel slouch boots from Payless shoes. Comfortable, kept most sand out, water and milk splash resistant, easy to wipe down, no lacing up and at $20 a pair with a BOGO half off sale I got them in two colors (black and brown) Best shoe purchase I’ve ever made. Plus the shoes are basically named after me. When I rock my school shoes – I wear sketchers flip flops in the spring/summer. And sketchers flats in the winter. I also wear boots in the winter – but always flats. Not sure how anyone could have heels when teaching Kindergarten?? ????‍♀️???? My go-to teacher shoes are my Mickey Mouse Crocs. They are the most comfortable shoes ever. Of course it doesn’t hurt that the kids love them too!!! My lace up Birks with dressier pants, grey Vionics with jeans, and my most favorite navy and aqua Vionics with my Friday jeans. Sorry, Pete. I don’t own a pair of cool white shoes. I’m allowed to wear flip flops. My go-to shoes are either sketchers or crocs! So comfy and able to keep up with the kids! Also the shoes I had-painted in a Pete the Cat theme! I like anything that has a good arch support and cushion. Being on my feet all day with my firsties means I need comfortable shoes. Thanks for the chance to win a sweet prize. I mainly like flats such as flip flops, ballets or sandals until the weather gets cooler then my tennis shoes or boots. I am lucky to have a flexible dress code with shoes. Toms so many great styles and patterns I love them not to mention they’re washable!! My favorite go to teaching shoe are easy spirit flats. I’m constantly moving while teaching first grade, so I go for comfort! I love Skeckers and Clarks. My go to teacher shoes are Adidas and flats from Target(inexpensive & comfy) !! My favorite teacher shoes are my Nike Free tennis shoes. They are awesomely comfortable and my feet don’t hurt at the end of the day. Sketchers! Lightweight & comfy! Love this tote bag! Keen or Born. Worth every penny! My go to school shoes are Sketchers!!!!!! I love the air soles to get me through a hectic pre-k day! Sketchers with memory foam! So comfortable! either of these type of shoes with business causal or more dressy outfits. I love sandals and slip on shoes, but they have to be comfy when I run after my two year old class! My favorite teacher shoe is actually Danskin tennis shoes from Walmart! My go-to teacher shoes are my converse sneakers! I love all the funky patterns and colors….especially my mustache ones. I also lean towards tennis shoes if I’m not feeling converse. I mean I’m a preschool teacher, being comfortable is imperative! My go-to shoes are my Toms! They go with anything and are the most comfortable when I am on my feet all day! ???? My go to shoes are anything low heel. I like flat boots in the winter and sandals and sneakers in the spring. As I get older it has to be about the comfort. I have to have something that will not hurt my feet all day. I don’t know how some teachers wear high heels to school. Just looking at them make my feet hurt lol. My go-to teacher shoes are converse or tennis shoes! I love being comfy so I can run around with my pre-K students! We LOVE Pete the Cat in Pre-K! Anything comfortable and on sale! Gotta love good deals on shoes! Anything flat and comfortable that I can move quickly in if neccessary. Skechers makes alot of shoes that fit that bill. My go to work shoes are anything flat. I only wear slippers or flip flops in my house and only flats at work unless it’s PTC when I’ll be sitting. I really don’t like wearing shoes. If my students are out of the classroom my feet are out of my shoes! Flats! Sandals as long as possible. ???? Not sure why the questions marks. I want to say “my blue suede shoes”, they made me dance around the room, but I don’t have a pair anymore. So I would have to say my sketchers. I have yet to find them! ???? My Frankie 4 sneakers – they are designed by a podiatrist and offer comfort and support. They are also super cute. I love Jambu, Clarks and Sketchers! My go to shoes are usually hi-tops. I have several different ones…my newest are pink Sketchers. I like to wear something that is comfortable and slips on. I usually buy Hush Puppies but always looking for new ideas!!! I love my white Sketcher tennis shoes!! My go-to shoes are anything comfortable. My favorite is New Balance! My go to shoes are anything with memory foam! I prefer sketchers but I had a pair of Nike with memory foam and they were really comfy too! My favorite is black ballet flats! Black goes with any outfit and they are also super comfortable and durable! They also are ideal given that we are on our feet for a large portion of the day & they also are very easy to clean!! My favorite are airwalkers by payless because they are uncomfortable and habe food arch support bit do not cost a pretty penny. My favorites are my sneakers and my BOC clogs, my comfy shoes! My favorite teacher shows are Sketchers, they feel like I’m wearing slippers. My go-to teacher shoes are my Converse All Stars. I have them in 10 different colors. My favorite go to teacher shoes are KEDS. I have several colors that I can match most of my outfits. If the outfit is too dressy for KEDS then I switch to TOMS – I have several colors of them as well. ???? My favorite shoes are flats. They are easy to put on and allows me to keep up with my little friends. Being a Kindergarten teacher, I need to be up and moving all day. I am a huge fan of Sketchers. Last year I purchased Skechers Performance Women’s Go Walk 4 Pursuit Walking Shoe. I am sold! Most comfortable shoes ever! Any kind as long as they have comfort fit insoles. I love my New Balance 🙂 I work with preschoolers, so I need to be ready for a lot of movement!! My go to shoes are my cowgirl boots! Tom’s all the way baby! I usually wear comfortable ballet flats, wish I could do something more sneaker like for support but I don’t feel they’re dressy enough. My go to shoes are comfortable flats! My Sketcher sneakers with memory foam. Heaven on my feet. Sneakers are always my go to shoes. When working with elementary kids, you have to be able to play with them on the playground, right? Vionics! They are fairly expensive, but so worth it. Luckily they have some very attractive designs compared to other orthopedic shoes, i can teach all day in them! My go to favorite teacher shoes are Sanuks. I’ve had 7 pairs of the exact same shoe. I’m a big fan of sketchers. They are super cute and comfortable. Ballet flats all the way! Comfortable ones so I can follow my preschoolers in all their energetic play! Black nike sneakers are my go go school shoe since I am a pre-k teacher I do a lot of running everyday!!! But I love it and wouldn’t change it for the world.